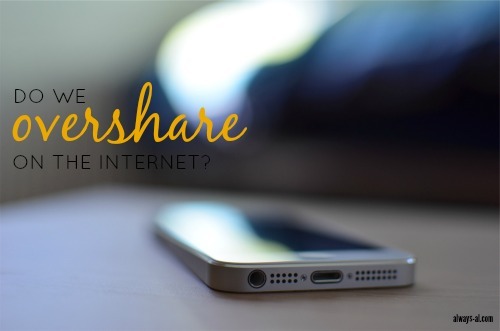 Do We Overshare On The Internet? The other day I was scrolling through my Facebook feed. I'm not very active on Facebook, but occasionally I like to see what everyone is up to. I guess you could call me a "lurker." My feed was full of photos of Valentines Day gifts, and how people were celebrating with their special someone. More than a few people had photos of rose petals on beds, and photos of love notes. While I appreciate that people love eachother, and am certainly not a prude, I couldn't help but ask myself what the line was drawn for sharing things online. People were sharing these personal gifts and moments. It just makes me wonder what is enough. I'm all for sharing these special moments, but when it gets to be very personal, it gets a little bit much. I feel like not everything needs to be put online. As a blogger, I'm someone who has a lot of my personal information on the internet. I have shared a lot of my personal opinions and feelings. But I always think about leaving my internet "imprint," and think about my audience. I wouldn't ever want to put anything out there that was inappropriate or that would hurt or embarrass myself or my family in any way. The internet is forever, and I think a lot of people forget that. I am still dealing with spam in a closed email account from something I signed up for YEARS ago! Sometimes I wish that before people posted things online, they would pause and think about it for a second. Is that how the they really want to represent themselves forever? Do you think that we overshare online? Do you think this is a problem? Am I just being a psycho over thinker? I do think oversharing can be a very easy line to cross especially as Bloggers. We want to stay in the feeds and keep our Readers/Follwoers engaged BUT I also agree that at times taking that moment to pause before clicking 'share' can make a big different. The internet is basically forever so thinking about that can help us stay on the safe side of the share line. I definitely don't think you're an overthinker. Oversharing online is very real. I blog as well and I do share a lot about my life and I do think I keep a fair balance of what's appropriate to share and what isn't. If I ever discuss my friends I do ask them if they'd be okay with being mentioned on the blog beforehand and I try to not share any personal details about them unless they want me to. I recently posted about having a job interview last week and I really struggled with whether or not it was appropriate to mention it. I know my interviewers are probably looking me up on the internet and I want to make sure I show my self off in a responsible way. On the flip side, the company I work for knows i'm in search of different opportunities so I knew they wouldn't be super offended if they heard I had an interview. It's all about balance. I agree! It's so easy to just hit that share button but we really need to think about what we're saying before we post. That tweet will be out there forever and if its hilarious now, it might be super embarrassing later on. "I always think about leaving my internet "imprint," and think about my audience. I wouldn't ever want to put anything out there that was inappropriate or that would hurt or embarrass myself or my family in any way." I totally agree with you, and I fall into the same line of thinking. As bloggers, we walk a fine line of what we feel is OK to share and the things we want to keep to ourselves. I've been thinking about this a LOT recently since I'm having a baby in a few weeks and what kind of legacy I want to leave for her, as well as what I want to share and what I'd rather keep private so she doesn't stumble upon it years later and feel embarrassed that her mother shared a photo of her in the bathtub (or something like that.) It's hard to find that balance, but we've got to keep trying to figure out what's best for us. I agree with this 100%. I am amazed at the personal stuff people share online. I share a bit, but some things I want to keep between my family and me. One thing my dad is VERY particular about is when I post about going out with my family. He gets really upset because he doesn't want the world to know that we are out doing something and that no one is at our house, leaving it to be the perfect time to break in. I used to think he was being super paranoid, but as I watch how many times people post where they are or what they are doing, I think he has a point! I have tried to be a little better about posting what I did for the day AFTER doing it! YES! People overshare like crazy. Sometimes it's just annoying, but other times it's downright creepy. I wouldn't share bedroom items or what is written in the cards online. I would share pictures of flowers and gifts. All my family is out of state so they like seeing mushy family stuff. For the most part I try to really watch what I post online. I definitely try to think before I share. But I have to admit that sometimes I am glad when other people overshare. For example, sometimes people post hilarious, hilarious stories and photos of their kids. I have to admit that O laugh . . . but I wonder how the kids will feel in 5, 10, 30 years when those stories and pictures still live on through the Internet. In 40 years we may get to see pictures of presidential candidates sitting in piles of poo. We may hear stories about how they, as a 7 year old learning about hunting and that meat comes from animals, asking about eating people. Anyway, I try to say to myself, "Is this something for a certain person? If so, can I just e-mail it instead of sharing it with everyone on both our friends' list?" Yeah. I guess the line is in the details that you share. Our family is far away too, but I tend to share more in texts and phone calls. True. Sometimes I'm just looking through Facebook though, and then I feel like a stalker and almost like I'm intruding for looking at their stuff. I've never thought of that!! I have always heard about not posting when you go on vacation, but even when you are just out of the house is true too!! Right? Like, nobody needs to know some stuff. Keep it personal. That is true. It's a constant balance, especially as more and more is getting online. I heard on the radio the other day that if someone steals your cell phone, they have access to your whole life. It's so scary to think about. I think about that too with what is work appropriate. I was thinking about putting my blog on my resume, and am still wavering. I'm very proud of this space, and literally anyone could happen upon it. But I just don't know. Yes! Even if we delete things, they stay there forever. I hate when people post things of YOU without asking, that you might not want online. Well then you are a stronger woman than I because I'm not calling and texting alllllllll those people individually. In laws included!